Wherefore God also hath highly exalted Him. – Philippians 2:9. God has raised Christ from the state of obedient humiliation, and has exalted Him to the very highest height and sublimity. Now Christ, also according to His human nature, uses the divine majesty continually and fully, without any restrictions. This is what we call Jesus’ State of Exaltation. God has given to the Son of Man, Jesus Christ, a name which is above every name. At the name of Jesus every knee should bow, of things in heaven, and things in earth, and things under the earth, and every tongue should confess that Jesus Christ is the Lord, to the glory of God the Father (Philippians 2:9-11). Blessed is he who gladly by faith acknowledges Jesus to be the Lord! Woe unto him who, in unbelief, refuses to do this! The day will come when he will be forced to acknowledge Jesus as Lord in dreadful trembling and wailing when Christ returns in glory to judge the world. – Our Lord entered His state of exaltation when He was quickened in the grave (when He was brought back to life). Having been quickened, Christ triumphantly descended into hell to proclaim His victory, and then showed Himself to His disciples as the Risen One. 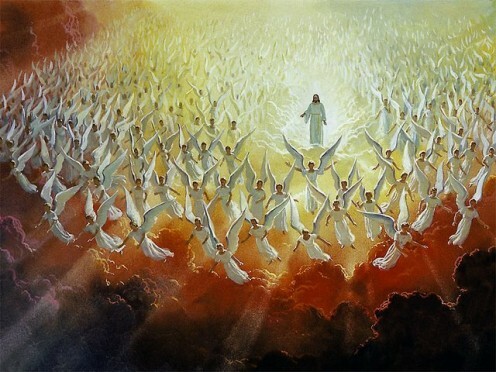 Thereafter, He ascended into heaven and sits at the right hand of God the Father Almighty. In His exaltation, power, and glory all the world shall see Him when He will come again to judge the quick and the dead. And in His state of exaltation He will remain forever. My dear Christian, know your Savior, your beloved Savior, who so dearly loves you in His exaltation. And then rejoice exceedingly! Who or what can harm you – who or what can rob you of salvation, since your Savior is exalted above all things and encompasses you, and guards and protects you with His great divine power? PRAYER – Lord Jesus, my Savior, gladly do I bow my knee at Thy name; with great rejoicing do I confess that Thou art the Lord, to the glory of Thy Father. In Thy humiliation Thou didst redeem me; and in Thine exaltation Thou dost continue to bestow Thy grace upon me for my salvation. I commit myself into Thy hands, which were affixed to the cross for me, and which now exercise all divine power for me. O Lord Jesus, my glorious Savior, I wait for and hope in Thee alone; save me! Amen. A hymn of glory let us sing; New songs throughout the world shall ring:—Alleluia! Christ, by a road before untrod, Ascendeth to the throne of God.—Alleluia! Oh, grant us thitherward to tend And with unwearied hearts ascend—Alleluia! Unto Thy kingdom’s throne, where Thou, As is our faith, art seated now.—Alleluia! Be Thou our Joy and strong Defense, Who art our future Recompense:—Alleluia! So shall the light that springs from Thee Be ours through all eternity.—Alleluia! O risen Christ, ascended Lord, All praise to Thee let earth accord,—Alleluia! Who art, while endless ages run, With Father and with Spirit One.—Alleluia!